The Mythbusters TV series finale airs Saturday, March 5, 2016 at 8:00pm ET/PT on Discovery. All of the series hosts — Adam Savage, Jamie Hyneman, Kari Byron, Tory Belleci, and Grant Imahara — will reunite for the finale. Mythbusters, which doesn’t consistently divide the show into seasons, premiered in 2003. 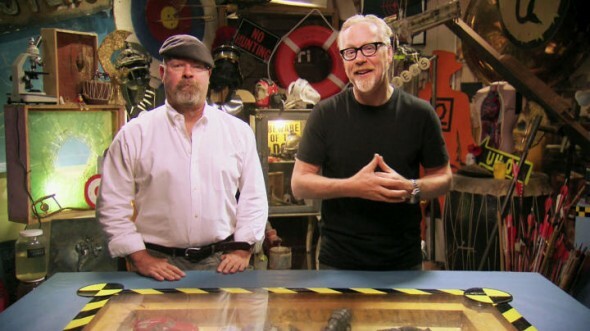 Discovery says, “After 248 episodes, 2950 experiments, 1050 myths, and 900 explosions, MYTHBUSTERS will go out with a bang in the epic and explosive series finale episode.” That’s a lot of busted myths. (Los Angeles, Calif.) Since 2002, MYTHBUSTERS hosts Adam Savage and Jamie Hyneman have used science to separate fact from fiction in spectacular style. But as the saying goes, all good things must come to an end. After 248 episodes, 2950 experiments, 1050 myths, and 900 explosions, MYTHBUSTERS will go out with a bang in the epic and explosive series finale episode airing Saturday, March 5 at 8:00pm ET/PT on Discovery. The seven-time Emmy(R)-nominated series – and the longest-running series on Discovery – premiered on the network in January 2003. MYTHBUSTERS led an exciting and brand new approach to science and accomplished what had never been done before: making science fun. This year, in its final season, Adam and Jamie have tackled some of the biggest myths they’ve ever tested from classic categories that made the show part of our cultural lexicon: car stunts, social science, viral videos, explosions (of course! ), and rockets. Prepare to be blown away as Adam and Jamie have put together an epic grand finale episode. In the finale, an RV gets blown to kingdom come, Buster goes supersonic, Adam takes the most wild ride imaginable and then it all boils down to a Cement Truck with 5000 pounds of ANFO. Following the episode, all five MYTHBUSTERS hosts from its 13-year history – Adam Savage, Jamie Hyneman, Kari Byron, Tory Belleci and Grant Imahara – will come together for one last hurrah in an unforgettable reunion special airing at 9:00pm ET/PT. Deep within M5, the MYTHBUSTERS will join forces to pull back the curtain as never before and give an enlightening and emotional farewell to the television icon. Additionally, very special guests and celebrity fans will pay tribute to the groundbreaking series in the reunion special. The day following the series finale of MYTHBUSTERS on Discovery, Science Channel will premiere a never-before-seen episode from the series on Sunday Mar. 6 at 8pm. This special episode features one of the duo’s favorite mechanical cure-alls: duct tape. During the run of MYTHBUSTERS, duct tape has been the focus of many stories and crucial to almost every myth the team has tackled. Adam and Jamie have built boats, hats and even a bridge, and they have one more duct tape build up their sleeves. In this special episode, viewers will see the duct tape build to end all duct tape builds in size, engineering, complexity and sheer ambition. What do you think? Are you a fan of the Mythbusters TV show? Do you think the series is ending at the right time, or do you wish it would have been renewed for another season? I’m sorry you’re losing a show you enjoy. Thank you for reading and commenting, Vicki. Thanks for reading and adding to the conversation, Grandizer.